Cutting edge length: 6.00 in. Blade thickness (near bolster): 0.08 in. Blade thickness (at midpoint): 0.05 in. 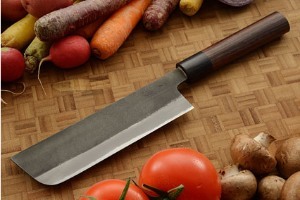 Description: The nakiri usuba is a traditional Japanese knife ideal for chopping fruits and vegetables. The edge is double beveled, like a Western knife. 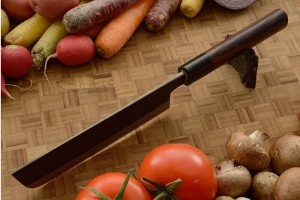 Though sometimes called a vegetable cleaver, the thin edge geometry makes it a precision tool, rather than a Japanese equivalent to meat cleavers. Nakiri make fast, accurate work of thin slicing and chopping. Mutsumi Hinoura, is widely considered to be amongst Japan’s elite group of highly revered bladesmiths. He lives in Sanjo, in the Niigata region and is the son of renowned bladesmith Tsukasa Hinoura. This area is renowned for its handmade cutlery experts and is the home of makers such as Yoshikane, Shigefusa, Iwasaki, and more. Mutsumi studied industrial engineering at Niigata College of Technology and graduated in 2001, when he began working as a full time bladesmith. Like his father, he is very active in promoting the art of bladesmithing within the Niigata region. Mutsumi has become famous for his craftsmanship and ability to forge knives with excellent balance, sharpness and a stark beauty that speaks to Japan’s feudal past. Each knife is individually hand-forged beginning with an aogami super carbon steel core (hagane). The smaller crystalline size of this carbon steel results in superior edge holding when compared to nearly any other steel. 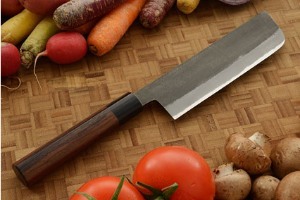 Many knifemakers and users feel that aogami super is among the best carbon steels used on kitchen knives today. Additionally, aogami super is less reactive than many carbon steels such as shirogami. A dark kurouchi finish from the last phase of heat treatment adds a limited degree of rust resistance. This time consuming process creates a knife with outstanding edge holding and beauty. Particular attention should be paid when washing Kurouchi finished blades as a scouring pad can potentially wear off the black finish. The blade is hand forged to shape with a tremendous distal taper - beginning with a thick spine where the blade travels out of the handle and quickly moving into a thin, high performance spine as it moves toward the tip. This ensures optimal balance, strength and control. The spine is nicely rounded for comfort. Convex ground sides assist food to release from the knife while slicing. Because this knife is forged from carbon steels, we recommend using camellia oil to avoid rust. The "Wa" style handle is called 'shinogi'. A ridge travels along the right side of the handle. While designed for right handed use, most lefties find this handle style equally comfortable. 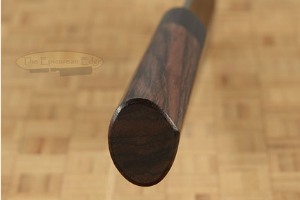 Natural macassar ebony is combined with pakkawood for a handle that will last a lifetime. Like other kitchen knives, this knife should not be put in a dishwasher.